31 years, 5 months, 26 days old age. 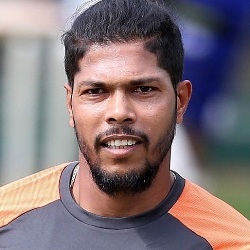 Umesh Yadav will turn 32 on 25 October, 2019. Only 6 months, 4 days, 21 hours, 52 minutes has left for his next birthday. Umesh Yadav has celebrated the total number of 31 birthdays till date. See the analysis by days count and bar graph. 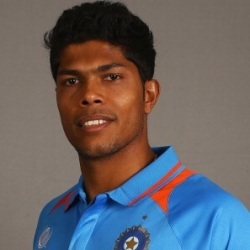 Umesh Yadav was born on 25-10-1987 in Nagpur in the state of Maharashtra, India. He is an Indian Cricket Player. Umesh Kumar Tilak Yadav is popular right arm fast bowler from Indian Cricket team. He attended Government Higher Secondary School in Walani and is a native of Uttar Pradesh, though he stayed in Maharashtra. He also plays at the domestic level for Vidarbha cricket team. Before coming into cricket, he wanted to join the Indian army or police force but he was rejected there. He started playing with a tennis ball. He joined Vidarbha team in Ranji Trophy and then represented Air India in a twenty20 tournament. He played for Vidarbha in Ranji trophy against Madhya Pradesh. He was selected for Duleep Trophy representing Central Zone. He made his debut and was purchased by Delhi Daredevils in Indian Premier League 2010. He was asked to replace Praveen Kumar in World T 20 cricket squad in 2010 but was not able to make out. He made his debut in One Day International (ODI) cricket in May 2010 against Zimbabwe in tri-nation series and in next year test cricket debut against West Indies. After a break, he returned in 2011 for ODI series played against England. He was part of the 2011-12 Australia tour. He bowled a delivery at 152.5 kmph which is highest bowling speed till now by an Indian. He made his T 20 cricket debut in Pallekele against Sri Lanka. He had also played for Kolkatta Knight Riders and Delhi Capitals in Indian Premier League in the past and is currently playing for Royal Challengers Bangalore. After recovering from injury, he was selected for the Australia Tests for 2014 tour and then for ICC World Cup 2015. He performed excellently in a world cup and was one of the best frontline bowlers in the series. With the emergence of Jasprit Bumrah and Bhuvneshwar Kumar, he has missed out on White Ball cricket after the 2015 World Cup. He though is still a favoured option when it comes to Test Cricket. He is born to Late Kishori Devi and a Coal-mine worker (at Khaperkheda) Tilak Yadav. He has two elder brothers and a sister. He married the fashion designer from Delhi Tanya Madhawa in 2013 after dating her for 2 years. He left his studies after completing the 12th Standard examination. Surprisingly the reason was not his cricket career but was his no interest in studies. He always wanted to be in Army but was unable to qualify it. He even tried for policeman post after rejected from Army but failed there as well. He was ‘Best Indian bowler’ in ICC 2015 World Cup and ended up picking 18 wickets in the tournament. He is the first among the players from Vidarbha region to play for the Indian team. He loves Saoji food. Shahrukh Khan and Amitabh Bachchan are his favorite actors. Vidarbha Hurricane, Babloo, Vidharbha Express are his nicknames.